2In a large bowl, toss together the oats, pecans, coconut and pumpkin seeds. In a small bowl, stir together the pumpkin puree, brown sugar, honey, molasses and vanilla. Add to the oat mixture and toss to coat well. 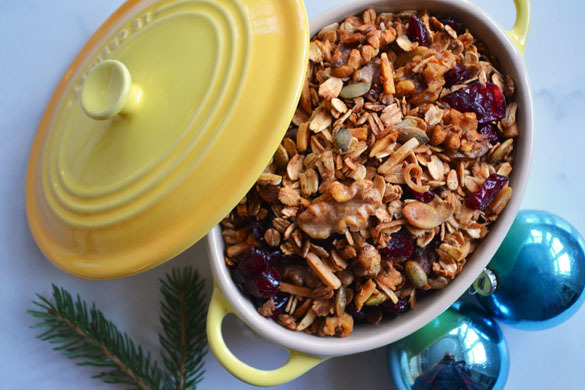 3Spread out in a single layer on a heavy rimmed baking sheet and bake for 30-45 minutes, stirring once or twice, until the granola is golden and crunchy. Remove from the oven and stir in the cranberries. Cool completely.